All with 5 - Denny Hamlin, Brad Keselowski and Dale Earnhardt Jr. 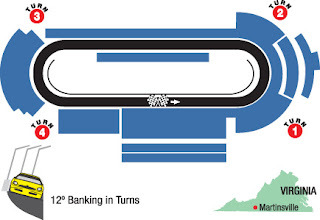 The Likely Suspects: Martinsville Speedway is known for great racing, as well as its famous hot dogs. Although 23 drivers have multiple wins at Martinsville, only four active drivers have multiple wins: Jimmie Johnson (eight), Jeff Gordon (eight), Denny Hamlin (four) and Tony Stewart (three). As you may have guessed, Hendrick Motorsports leads the NASCAR Sprint Cup Series in wins at Martinsville Speedway with 21. Picking these Martinsville greats will enhance your score this week: Jimmie Johnson, Jeff Gordon, Clint Bowyer, Denny Hamlin, Dale Earnhardt Jr. and Kyle Busch. Also, if Chad Knaus dials in Jimmie's car, and it appears to glide on the track during practice, you better pick him. When Jimmie is good at this track, he is really good! My 2 Cents: My no-brainer pick this week is tie between two stellar drivers in the Hendrick Motorsports camp: Jimmie Johnson and Jeff Gordon. Keep in mind that Dale Earnhardt Jr. and Kyle Busch are also fine picks. My next choices are Ryan Newman, Denny Hamlin, Brad Keselowski and Jamie McMurray. I will complete my team with Austin Dillon and Danica Patrick. Enjoy the race!